Hope you all had a wonderful week after bidding goodbye to the summer months over Labor Day! Marcus and I had such a fabulous time in Block Island (don't worry -- a comprehensive post is on its way, with a teaser photograph below), and though I was very sad to leave it, we're already thinking about making plans to go next summer. Anyways, here's this week's roundup in noms/reads/links/eats. Happy, happy Friday! 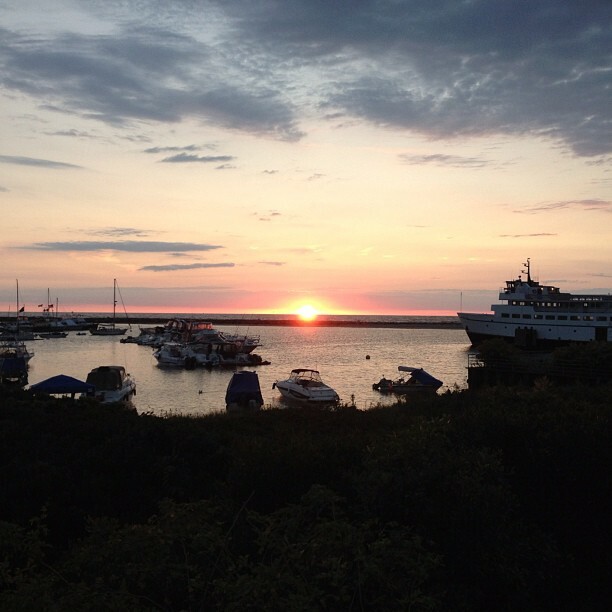 Glimpse of the fleeting sunrise whilst in Block Island, Rhode Island on September 2, 2012. A history of New York City in fifty objects, including the Automat, oyster, bagel, artichoke, and Anthora (i.e., the New York Coffe Cup). The correlation between restaurant prices and reservation times through services like Savored (thanks, Jia!). Lots of love all around to Chef Daniel Humm and general manager, Will Guidara, of Eleven Madison Park and The NoMad Hotel from The New Yorker, Grub Street New York , and The New York Times about the radical changes happening this fall and a family meal. Kitchen 101 by Chasing Delicious on meat cuts. The Nitpicker, Jason Kessler of Bon Appetit, gripes about food being served in martini glasses. Slate magazine on eating every variation of Pepperidge Farm cookies (Milanos and Genevas included). Why some restaurants are exempt from letter grades in New York City. Digging these delicious city print designs and these cool tilted teacups via Acquired Taste magazine. Green tea Kit-Kat bars spotted on Oh Joy! Campbell's special edition cans of condensed tomato soup to commemorating the 50th anniversary of Andy Warhol's pop art canvases featuring the brand. Twenty unusual uses for Coca-Cola, rounded up at Ecosalon. The world's first pizza museum is to open in Philadelphia. A chocolate éclair hot dog? This you have to see. Nice piece on a food photography workshop with Aran Goyoaga of Cannelle et Vanille over at Eat Live Travel Write. The Big Gay Ice Cream Cookbook is set to be released in 2014 during the spring. New York City restaurant wishlist compiled by the Dining & Wine folks at The New York Times as well as a preview of new bars and restaurants this fall. Gorgeous photographs by Celeste's Wanderlust of Mindy's Hot Chocolate in Chicago -- definitely need to go next time I'm in town! Yebisu Ramen review by Yaokui -- another ramen-ya to hit up in Brooklyn! Would love to do this one evening -- a sunset cruise along the Hudson River with wine and cheese! Jeni's Splendid Ice Creams' truck is coming to New York City next week to promote vendors that are now carrying its brand of frozen pints -- see calendar for various stops/dates/times!